The 2018 Honda HR-V is a subcompact-crossover SUV that offers more interior room than the Mazda CX-3 and a lower price than the slightly larger Subaru Crosstrek. The HR-V delivers great fuel economy and handling, but its interior is marred by an overabundance of touch-screen-like controls and the glaring omission of driver-assist features such as pre-collision braking and lane-departure warning. 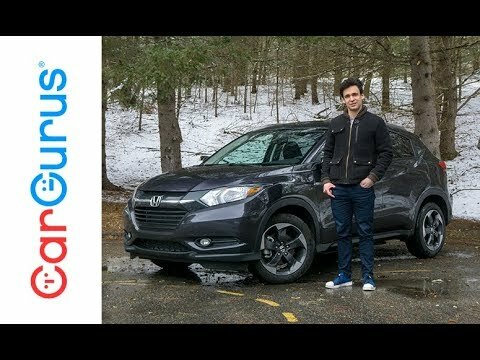 Positives vs negatives Honda HR V.
My HR V has several very great features a brake hold so you don't have to keep your foot on the brake in traffic. It has paddle shifters for downshifting. Of course auto climate control and backup camera. It has what I feel is a non feature when you turn on your right turn signal it shows you with a camera on the right side view mirror what's behind you. In my opinion it would be way better on the left mirror if you were passing you could make sure nothing was coming along side of you. Plus if you pass a car you think I am going to. Pass this redcar and after you do you look for it in your mirror and know its the car you passed and return to the no passing lane. I feel that is a design error. I have leather seats and it is fabulous for cleaning them. The push button start is great but sometimes I want to jump out of my car and run quickly into the convenience store or post office and have to grab my whole purse and take it with me because the keys are buried in it somewhere. The touch screen is a little complicated to use for jumping between menus. There are about 8 of them. The gas mileage is great and it has a green light surrounding the speedometer that shows green when you are getting the best gas mileage. However it has a eco button that I leave on all the time because frankly I don't know how to use it. The last thing I can bring up is that it is AWD I have not yet had the experience of driving it in the snow but that is one of the primary reasons I got it. The magic of the Honda hr-v.
Pros: the car performs great. Moving from a sedan to a small crossover was anxiety provoking but the hr-v can be handled like a sedan. Enjoy the height and the outside color. Enjoy the bike lane camera as well as the backup camera. Enjoy the seat height for short people and the roominess and flip up seats in the back. Due to the flip up magic seats in the back, I can put my groceries in the back instead of having to open up the trunk all of the time to place them their when I go shopping. Like that the 2018 hr-v features include letting me know when an oil change is due or when I am low on gas or air pressure, etc. Mileage is great and it has economy to save on gas which I love. With the economy button on I saved a lot on gas during the summer months when I had to run the air conditioner a lot. Cons: the trunk space is limited for items that are large, the paint chipped easily on the door when it tapped something lightly. Aside from those cons I like my Honda hr-v. I did like my car that I bought new in July 2018. BUT, since September I’ve had nothing but issues with both the car and Century Honda where I purchased it! The owner Mike MacGillivray is disrespectful at best! Honda Canada has tried to help but is no longer! The car’s battery has died several times leaving me stranded! I am a single mom who depends on my vehicle! It is undependable, burns gas (9.5-11.1 L/100km - up to 99.9 L/100), the oil is black and burns quickly, the sunroof stuck open, the weather stripping on the back door is falling off, and NO ONE at 3 dealerships can find the issue since the battery was replaced at Century in September! I’ve had it to a private mechanic and he diagnosed it at my own cost with transmission and braking system issues! I’ve had to pay out of pocket for a rental and although the service departments have tried, their computers cannot find the issues! Help please!! !